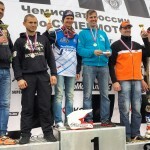 One more landslide victory for Russian motorcycle rider Makar Yurchenko! 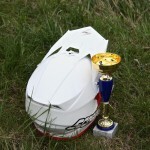 On the 2nd stage of Russian Supermoto Championship that took place in the circuit Firsanovka, Moscow, the 16 y.o. rider got again the first place on the podium. It is already the second victory for Yurchenko in this competition. After these two stages and “clean” victories in the Russian Supermoto Championship, Makar came closer to the title of the Supermoto Champion in Russia. 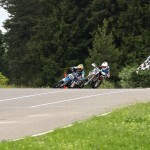 In MiniMotard class Yurchenko also came first to the finish line under the umbrella of the JMC Factory Team. Russian Supermoto Championship involves both amateurs and professionals with different categories: Pros (S1) (groups A and B), Open (Open), Fans (Street) and MiniMotard (Pit Bike). In 2015 Makar Yurchenko competes in two categories: Pros (S1) – AvtoMotoAlians team, and MiniMotard (Pit Bike) – JMC Factory Team. During the race in Firsanovka, Moscow, the track was half-wet from the heavy rain. Wet conditions gave the riders a great opportunity to test bikes in extreme conditions during trainings. However, severe weather conditions didn’t scare the visitors during the training days. As a reward they got a great performance and the chance to enjoy the impressive sliding of the professional riders. On the race day the weather stabilized. As a result Makar Yurchenko took again the first place on the podium, having Aleksey Orekhov and Artem Teslenko on 2nd and 3rd. 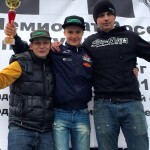 In the Russian Cup on MiniMotard Yurchenko showed a great fight for positions with his team mate Aleksey Smirnov (JMC Factory Team) and came first to the finish line with one more trophy to be proud of. The 3rd stage of Russian Supermoto Championship and Russian Cup on MiniMotard will be held on June, 7th, in Nizniy Novgorod, circuit NRing, together with the 2nd round of RSBK (Russian Superbike Championship International Cup 2015).